The Hawaii Department of Education's World Languages Program consists of instruction in 11 languages including American Sign Language, Chinese (Cantonese and Mandarin), French, German, Hawaiian, Ilokano, Japanese, Korean, Russian, Samoan, or Spanish, at the elementary and secondary school levels. 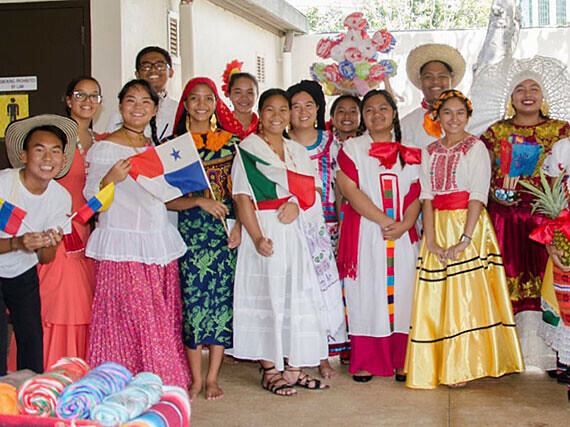 The Hawaii Department of Education's World Languages Program consists of instruction in 11 languages including American Sign Language, Chinese, French, German, Hawaiian, Ilokano, Japanese, Korean, Russian, Samoan, or Spanish, at the elementary and secondary school levels. At the Elementary level, languages are generally offered based on the interest and resources from the school community and may be taught during the school day or during after-school enrichment programs. Programs may be exploratory in nature with a focus on building awareness and interest, or they may have language proficiency goals. At the Secondary level, specific language courses vary from school to school based upon student interest and school resources and are most often sequential credit courses offered during the school day with a focus on developing communicative proficiency. Other courses that may be offered include exploratory courses, courses for heritage learners, and Advanced Placement (AP) courses. There is a large body of research that shows second language acquisition as benefiting cognitive development, academic achievement, and development of positive attitudes toward cultural diversity (American Academy of Arts & Sciences, 2017). Hawai'i’s multiethnic and multicultural community, its location in the middle of the Pacific Ocean, and a growing economy create a need for World Languages knowledge. Increasing and nurturing multilingualism and multiculturalism will provide advantages for students, notably a foundation for personal enrichment, scholastic achievement, and economic opportunities. Learning more than one language opens new doors and expands opportunities to learn as well as providing students with another view of one’s own native language and culture. The vision of the Hawaii State Department of Education & Board of Education Strategic Plan is that “Hawai'i's students are educated, healthy, and joyful lifelong learners who contribute positively to our community and global society.” Citizens of the world today need to be able to communicate in a language other than English, as global economies and new technologies continue to erase existing borders among nations. The study of other languages enables students to communicate with people in other cultures and to participate more fully in the global community. Goal 1, Objective 3 of the Strategic Plan states that “All students are offered and engage in a rigorous, well-rounded education so that students will be prepared to be successful in their post-high school goals.” World Languages courses, whether exploratory or sequential with proficiency goals, support a well-rounded and personalized education. Students may choose to engage in language learning to fulfill college prerequisites, to challenge themselves, or for personal reasons such as improving one’s heritage language. The Hawai'i DOE's Implementation Plan encourages schools to take action to “define/expand language acquisition approach” in the areas of biliteracy and dual languages. The World Languages program supports this action item by providing students with a range of languages with many courses being offered at the AP level and by offering opportunities for students to engage in language learning that supports communities such as heritage language classes or after-school enrichment programs. Additionally, two Board of Education policies aim to support language development: Policy 105-15 Seal of Biliteracy and Policy 105-14 Multilingualism for Equitable Education. Both of these policies promote multilingualism either by maintaining or increasing literacy in one’s home language or by becoming proficient in a new language. Multilingualism: All cultures and languages are valuable resources. Multilingualism creates learning environments that draw from the rich linguistic diversity and cultural strengths of Hawai‘i’s students. Seal of Biliteracy: To enable students to be college, career, and community ready in a global society, the Seal of Biliteracy is awarded upon graduation to students who demonstrate a high proficiency in both of the state's two official languages (English and Hawaiian) OR either of the state’s two official languages and at least one additional language, including American Sign Language.